I made some 1/3 octave-band frequency response measurements of my speakers, the results of which are presented in the figure below. 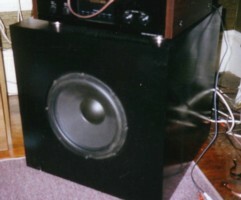 The measurements were made with a Bruel & Kjaer 2230 Type 1 (precision) sound level meter with a 1/3 octave band filter. The noise was the correlted pink-noise recording found on the Stereophile Test Disc #1. All of the measurements were made in my room (that is, not in an anechoic chamber). The measurements of the satellite (160 Hz to 20kHz) were made with the microphone 1 meter away from the baffle, and located at a height midway between the woofer and the tweeter. For measurements below 160 Hz, I placed the microphone ~1/2 inch away from the woofer. I realize I should have done this for frequencies from 300 and lower, and I will probably revise these results. The subwoofer woofer measurements were made close-miked. My pre- amp has a built in high-pass crossover at 80 Hz, so the high frequency roll-off is not a product of the driver or enclosure. The measurements pretty much speak for themselves. The raggedness in the 160 to 300 Hz range in the satellite measurements I believe is the product of room interactions, and I will try to provide close-miked response for that range. From 300 Hz 5 kHz, the response is essentially flat, even in the crossover region. From 5 kHz to 16 kHz there is a broadpeak which seems to be a characteristic of the tweeter. I may design a filter to lower that peak, but subjectively, I haven't noticed the rise. What surprised me was the sharp drop at 20kHz... I was surprised because I can actually hear the 20 kHz tone when played through my satellites. 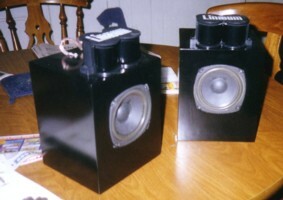 The subwoofer measurements also pleasantly surprised me when I saw that I am getting useable response down to 20-25 Hz. Playing the 20 Hz warble tone off the Stereophile disc I noticed that I couldn't hear anything, but I could feel my house shaking.